Once, Kate McAuley's life had been almost perfect. She was in love with a man who loved her, enjoyed her work, and was happy and content in her life. Having Lucas Barone walk out of her life was simply the first stage of a downhill spiral. Now, eighteen months later, Luke is back. He is obviously on the run from something, or rather someone, and that someone finds them. They go into hiding as Luke tries to determine who wants them dead. Together again, they must overcome deceit, treachery, and pain in order to survive. In the process, they discover that their passion for one another has never diminished. 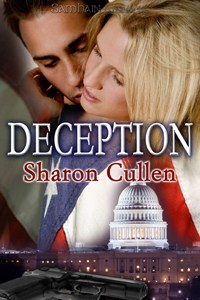 Deception was a romantic suspense that I didn't want to put down, even when it was over. The suspense kept me worried how they would come through, but the romance between Kate and Luke, and the pain they felt is what stood out. Luke had literally gone through hell during his time away, and Kate had endured almost overwhelming grief over so many losses during Luke's absence. I look forward to more stories involving the secondary characters in this book.